Last week’s post on the ‘Upstairs & Downstairs Brain’ attracted considerable attention, and elicited a number of responses – some favourable, some challenging. It appears that the implications of neuroplasticity are still very much at the early stage of consideration for many people, and, just how the new knowledge being generated can be put to use by coaches is not yet clear. Last week, I spoke about the limbic system (or old brain) as being ‘downstairs’, and the pre-frontal cortex (or new brain) as being ‘upstairs’. 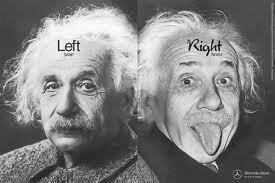 Today, let’s look at the brain from a different perspective – left and right. It has long been known that the left & right hemispheres of the human brain specialise in different areas of cognition, memory and reasoning. Put simplistically, the left side of the brain tends to be associated with more logical and analytical thinking, while the right hemisphere is linked to more creative pursuits and expressions of emotion, for example, through art and music. Furthermore, Dr. Jordan Grafman, of the National Institutes of Health (NIH), puts forward evidence that the left-frontal lobe in a normal brain is specialized in storing of individual events, while the right-frontal lobe draws out themes and connections. People who have suffered damage or lesions to their right-frontal area often find it difficult to understand the point of a story, or a movie that they watch, and find the use of metaphor and simile extremely challenging. They understand the words spoken, and can make literal sense of things, but they lose the ability to interpret, extrapolate, find abstract meaning and so on. But, from studying these unfortunate cases of people who have suffered brain damage, neuroscience has also discovered something fascinating about the way the hemispheres of the brain operate together. Some people who suffer damage or wastage in the left side of their brain, thereby losing their ability to understand the meaning of words, have been known to almost spontaneously develop unusual artistic and musical skills. In other words, skills that are typically processed in the right side of the brain. What is going on here? Well, Dr. Bruce Miller, a neurology professor at UC, San Francisco, argues that the left hemisphere would normally act as an inhibitor and suppress the full expression of the right hemisphere. Without the left hemisphere functioning normally, the right operates with no inhibitions, and is able to fully express its potential. (see Norman Doidge and “The Brain that Changes Itself” for an in-depth exploration of this area). This phenomenon provides an important insight into how people, without such brain damage, might exploit this knowledge. If we can free up one hemisphere from the distracting, inhibitory influences of the other, if only for short bursts of time, it may help us to allow aspects of our thinking, feelings, creativity and intuition, to surface and find full expression. 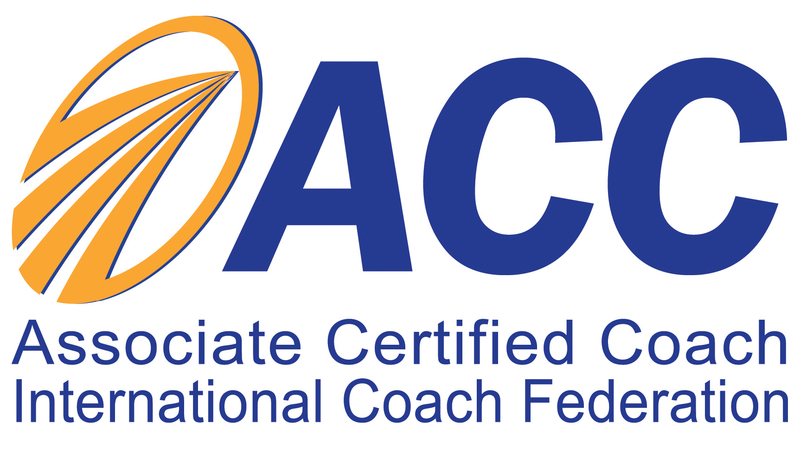 So……What does this mean for coaches? How can an understanding of this area help your clients? How can we work with clients to allow them to quieten their logical, rational voice, and give expression to their deeper, and often hidden (subdued) thoughts? Share your understanding of the roles of the hemispheres with your clients? Use this as the basis of a coaching conversation and explore what the client believes is happening in their brain. Ask powerful questions that connect with how the client feels, not what they think. Tap in to the client’s visions, values, beliefs and goals using creative and artistic methods (e.g. invite them to use music, drawings, cut-out images from magazines, describe things using smells,tastes and colours ~ ask what would work best for them). And why might it make sense to encourage our clients to quieten their left brain and give expression to their right? Certainly not because the left side of the brain is not needed, anything but. We clearly need both to function as complete beings. We need the left brain to plan, to analyse, to make decisions, to solve problems, and to articulate our thoughts and feelings. But if we are seeking new ideas, deeper insights and creative breakthroughs, we need to leave space for our right hemispheres to connect with our emotions, feelings and passions, to fire these up and provide the fuel that will drive them forward. No-one can speak more personally or expressively to this than Jill Bolte Taylor. Jill is a brain researcher who suffered a stroke. She plays out her remarkable and humbling story in this TED talk, whilst shining a light on the amazing structure and functionality of our human brain. Please share your own views on the ways in which advances in our understanding of the brain are informing your coaching. If you would like to receive brain-based coaching, taking advantage of the discoveries of neuroscience, please do get in touch. Simply submit your contact details on the Contact Us page and I will be delighted to contact you for an initial chat. This entry was posted in brain and tagged brain, coaching, hemispheres, Jill Bolte Taylor, leadership, neuroscience, Norman Doidge by louiscollinsblog. Bookmark the permalink. Yes, language and questions using the right words are good ways to tap into the right brain. I agree. Thanks for your comments. Brain geography is a great coaching tool. I use left/right brain, but personalize it more. I look at left/right handedness and whether someone writes “hooked”. Lefties tend to have language centers in the right brain, unless they write hooked (bending wrist to write upside down), in which case they have language in the right brain. Most rare are righties who writed hooked, because they have language in the right brain. Trivial, at some level, but the point is to bring out a range of capabilities and the choices we have to switch what we do and how we do it. This ‘hooked’ writing thing is fascinating. I have noticed quite a few lefties write ‘hooked’. I had assumed that it was so that they could see what they had just written (since we write from left to right) – but I’ll need to look more into that. Thanks for that, Allen. Fascinating post Louis as always! I was at a session last week with Damian Hughes and he was using different metaphors like ‘Chimp’ brain and ‘Reptilian’ brain, which was an equally fascinating way to view how our brains function. I love these different ways of considering these things and how they work and researching neuroplasticity more is definitely a key way forward! Thank John. Would like to have heard Damian talk. I have heard David Brailsford (cycling coach) use the ‘chimp’ metaphor – some athletes find it very effective. Indeed though left and right is sometimes misunderstood there are some powerful implications for individuals and corporations. Moreover society as a whole seems to be shifting more to a left mode of thinking which is worrying and makes us lose focus of the bigger picture. This is as important for individuals as it is for corporations. Thanks for your comments Andy. I read your post at http://andyhabermacher.blogspot.ch/2012/10/the-corporate-shift-to-left-in-brain.html. An interesting perspective. My sense is that the left brain’s analytical/rational/logical/planning approach is well-suited to solving low-level problems. By low-level I mean repeatable, practical and operational problems. Note – I do not mean to imply that these problems do not require sometimes incredible levels of intellect and knowledge – but they are typically problems of a ‘technical’ nature. The types of problems that the human race, businesses, governments, and so on, struggle with, are problems for which there is no existing solution, which require creative leaps of ingenuity, and genuine innovative thinking. This is where the right brain comes into its own. This is a major reason for encouraging right brain thinking. Absolutely – I also believe that one of the problems of the world is that we are trying to solve the big problems by analysing in a technical way and forgetting the connectedness of this – systems thinking…which the right hemisphere is very good at! Fascinating as it is to understand how the computer (brain) works, I wonder where the science is taking us? I find myself thinking more about the intelligence that created the computer and the source of the programmes that run on it. I think it is useful to have some insight into how and why people respond to a given situation – and then I wonder what to do with this information. What else should we take into account if we are to engage with our clients as fellow human beings? Hmm!! What else? I guess there’s hardly any limit. My feeling is that everyone is different, and no two clients are the same. We all respond to different things, and sometimes it can be the unexpected that makes us have that ‘Aha’ moment. For some it may be an insight into what is actually going on inside their head that helps things fall in to place for them, for others it may be a spiritual connection. I guess our toolbox needs to contain a lot of different tools. If you have strong right-brain interpersonal qualities you can rule the world! Daniel Pink argues in his new book ‘A Whole New Mind’ that empathy is one of six areas vital to success today. This is the ability to imagine yourself in someone elseʼs position, to identify and understand anotherʼs situation, feelings and motives. Apparently, 1 in 20 of us are natural born empaths highly adept at being able to read and understand people and resonate with them on many levels. Think you might be one of ‘em? Take this quiz here and find out! Recent studies in the US though, show that students have 40% less empathy than 30 years ago. Reasons for this are said to be societal changes i.e. violence in the media, modern technology, video games and the rise of social media generally which has reduced face-to-face interaction. Add to this a weird and hyper-competitive atmosphere with inflated expectations of success borne of celebrity ʻrealityʼ shows. If this is the case, how can empathy be cultivated? Well, the good news is that we all have the capacity to develop it through right-brain thinking and living. According to neuro scientist Dr. Shanida Nataraja, Westerners use the left hemisphere of their brain too much, focusing on the logical, rational and analytical aspects of the mind. The right hemisphere of the brain is associated with seeing the whole picture, emotional expression, creativity, non verbal awareness and visual and spatial perception and it is the neural site of empathy. That’s right – our brains are naturally capable of developing it! Or how about that yoga or pilates class? According to Dr. Rick Hanson, when you focus on your body and breathing, whether through meditation or something like pilates, dance or yoga, the area of the brain known as the (insular cortex) actually thickens; the part of the brain to do with the internal state of the body and gut feelings and the emotional state of other people. Have fun trying the colour test here to help you strengthen right-brain thinking or try this one. Other ways include telling stories, drawing and singing. These are all methodologies that can be introduced into communication skills training and soft skills training and have real impact in terms of personal development. Thanks ever so much for taking the time to add to the discussion. Very useful input. I may have to get into yoga – I have always avoided but if it helps my brain in this way then fantastic.